This is our third camper purchased; however, our first NEW one! Staff and service, Nick and Greg, along with finance, Rob were wonderful to work with! We purchased our 2017 Cougar and this a pleasurable experience. Our salesman Nick was easy to work with and was very knowledgeable. The financing was a breeze and Rob Lentz was very professional and we had a great time with him! The Sales Manager Chris who we call "Big Tex" was very cordial and was a great help with our purchase of our trailer. We would Definitely recommend to anyone to come to Delmarva RV for a purchase of a trailer. Great prices, Great Service, and overall enjoyable people to work with. Thank you Delmarva RV!!!!!! Today we bought our first camper from Delmarva RV. Our Adventure began with Nick, then Greg, and finally Rob. Everyone was great to work with!!!! 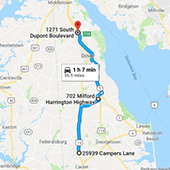 Welcome to Delmarva RV Center, where your complete, 100% satisfaction is our number one goal. We’re here to give you top quality service, products, sales, and to provide you with the best deal possible. Featuring reputable brands like Coachmen, Jayco, Grand Design, Forest River, and Keystone, we only offer the best for our valued customers. Our RV Service Center is here to serve both your new and pre-owned RVs, and our recently remodeled Parts Department has thousands of parts in stock to make it easy to find exactly what you need to keep your vehicle running.